In Bring on the Girls, P.G. Wodehouse and Guy Bolton's account of their life in the musical theatre of the 1910s and 1930s, there occurs a delightful account of a conversation between the two about plans for a new musical. Previously their collaborations were mainly with Jerome Kern, but he was not available for their new show. "Fine, but he wouldn't want me. He writes his own lyrics." "You mean the lad who could make a piano sound like a whole jazz orchestra?" "That's the one. He said he'd like to play us some of his music." "Every rehearsal pianist wants to play you his music." "I know, but I was with some people not long ago and they talked about this chap and someone said he was a genius." "You're sure it was the same fellow?" "Yes, I'd clean forgotten his name but when they said it I remembered it. I've written it down so I won't forget it again and when I get back I'll look him up." "That's right, I recall him now. Pink cheeks, nice smile, a terrifically strong beard that even the closest shave couldn't conceal." "If I decide he'll do, will you come over?" "Yes, but try to get Jerry. After all there's only one Kern." "True. Still, who knows? Maybe there's only one George Gershwin." Having grown up in England I may well have less of my childhood invested emotionally in this music than many North Americans, although the American influence was pervasive enough that at least half of the melodic material on this disc is instantly recognisable. Nevertheless, it may be that I can bring a slightly more objective view to this music than would be possible for somebody brought up conscious of the tradition of Gershwin rather than that of, say, Noel Coward. Richard Glazier, whose fascination with the music of Gershwin is lifelong, opens his recital with two studies by the great Earl Wild; Wild takes the Gershwin as a starting point, much as Liszt might have taken Mozart or Verdi as a starting point for one of his fantasies – with results which are, to these ears, no less musically satisfying than his great predecessor – although Wild's ambition is somewhat less all-embracing than Liszt's, who would probably have spun a Gershwin Paraphrase out to 15 or 20 minutes, as opposed to Wild's 2:47 and 3:19 respectively. Having opened on that high note, Glazier's disc never once falters, either technically or musically. He treads a fine line between treating the music with kid gloves and divesting it of its jazz-influenced authentic Americanism on the one hand and vulgarising it, thus riding roughshod over its manifold subtleties, on the other. It's a balancing act that few pianists are constitutionally capable of. Of the many high points on a recording which is a succession of high points, I particularly enjoyed Percy Grainger's two transcriptions, affectionate and effective, and those of Beryl Rubinstein (to whom the fleeting Sixteen bars Without a Name is dedicated) of the three famous songs ('arias', with all due respect, is surely too serious a word) from Porgy and Bess. Rubinstein, who – as Glazier tells us in his informative liner note – was born in the same years as Gershwin, made these transcriptions around 1945, the year they were published. They subsequently vanished and were only rediscovered by Glazier, in the archive of the Cleveland Institute of Music, while he was a doctoral student. 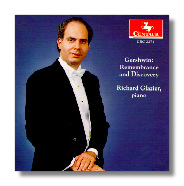 Their discovery alone would be sufficient reason to thank Glazier, for they are simply wonderful pieces, but he performs them – as indeed he does everything on this disc – with affection, insight and abundant technique. This record is a joy from start to finish; moreover, the exemplary, natural-sounding recording captures the sound of the piano very faithfully. In his liner note, Glazier relates the story of visiting Ira Gershwin at the age of 12 and his delight at being invited to play upon Gershwin's own piano. In a private correspondence he told me that, as he left, Ira Gershwin said to him: "people say my brother George played that piano, and Oscar Levant played that piano…someday maybe they'll say Richard Glazier played that piano".